I’ve noticed this week that all of the neighbors are putting out their American flags and bunting to prep for the Fourth of July. I feel so lucky to live in New England this time of year when you see all of the historic homes putting on their patriotic best. 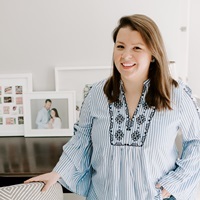 It gets me into the spirit for the holiday, and I look for all of the ways to add a little bit more red, white and blue to the festivities. 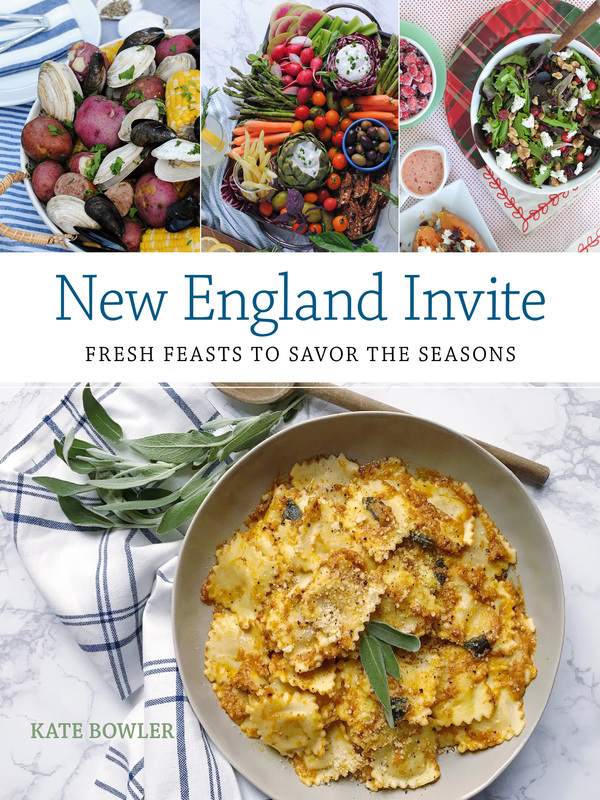 We typically spend our Fourth of July weekends hopping from pool parties to beach picnics to lakeside BBQs; so casual is the name of the game for entertaining. 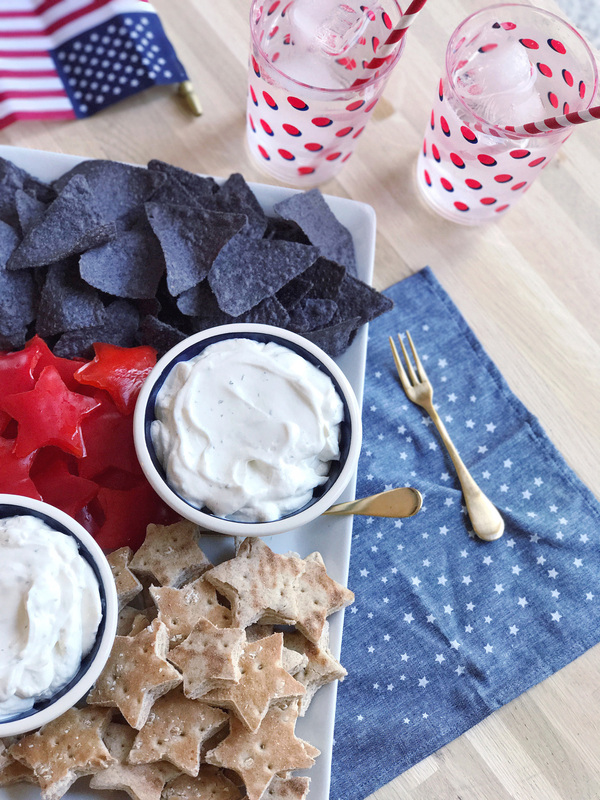 I thought it would be fun to give one of my favorite All-American BBQ staples a patriotic twist this summer: red, white and blue chips and dip! 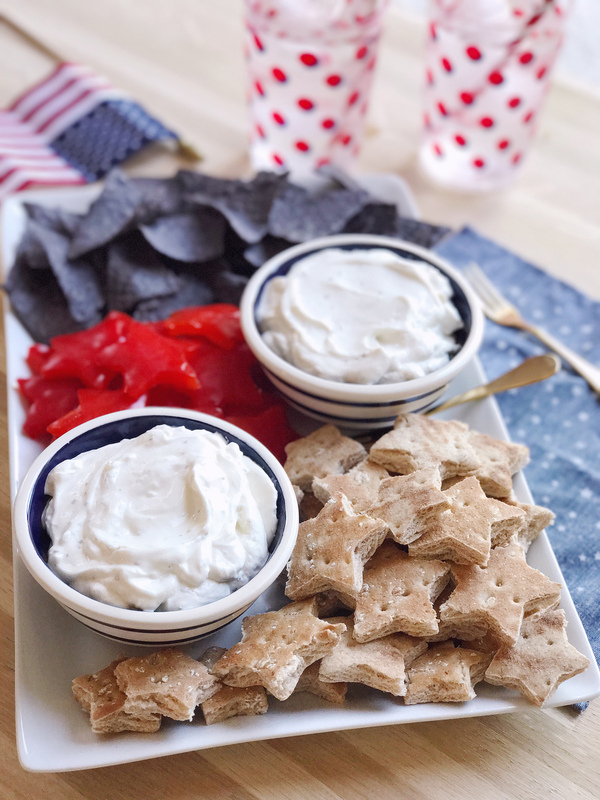 This dip platter is just about as simple as they come, but a few minutes of prep makes it look like you labored away in the kitchen for hours – and those are my favorite party tricks! 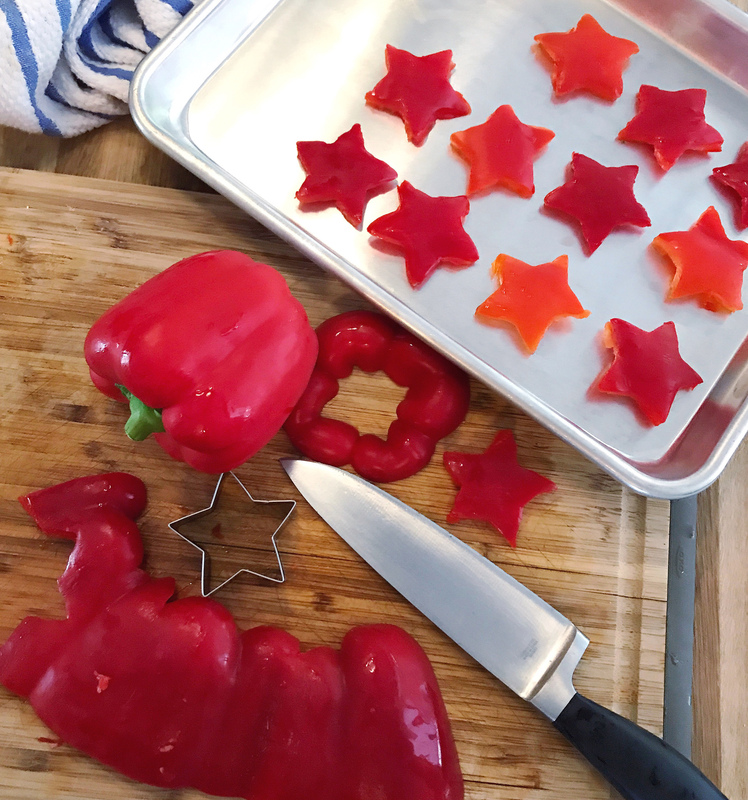 To start, I pulled out my star-shaped cookie cutters and got to work stamping out patriotic stars in red bell peppers. The star peppers are great for dipping (I love them with Heluva Good! Buttermilk Ranch Dip) and add a pop of red to your plate. Save the pepper scraps for a pasta salad, or cut a few extra and add the stars to a grilled kabob. Next I took my star cookie cutters to a stack of fluffy pita bread (sandwich thins from the bread aisle work well too) and stamped out lots of pita stars. You can toast these up for a crispy homemade pita chip, or leave them plain – I liked to have some untoasted on this plate to balance the crunch of the peppers and chips. 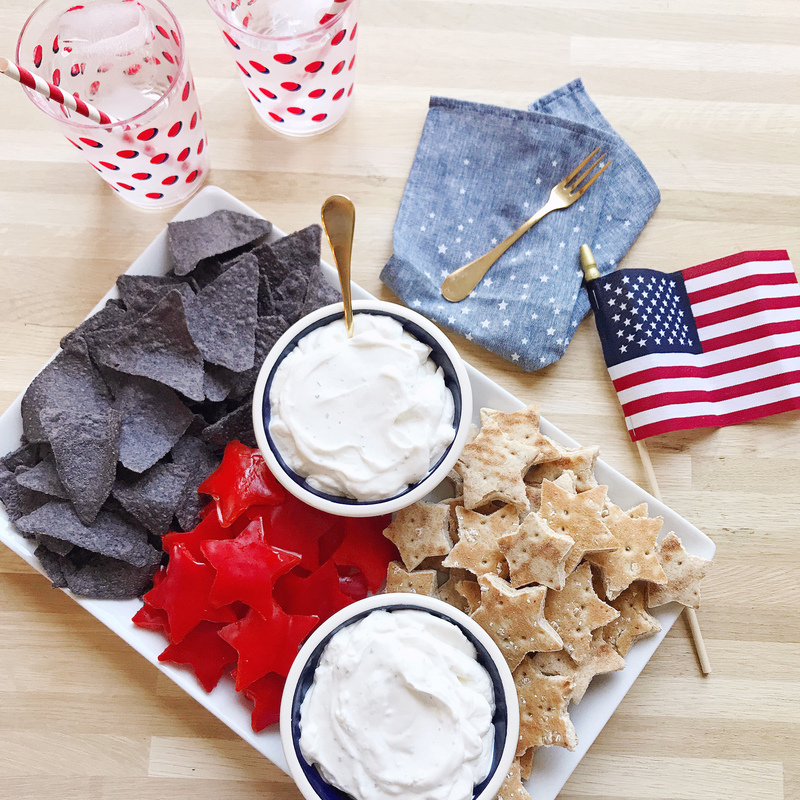 After your prep work, all that is left to do is assemble your patriotic chip and dip plate. I set out two pretty blue-striped bowls to keep with my theme and filled them up with my favorite dip flavors (Heluva Good! French Onion and Buttermilk Ranch dips). 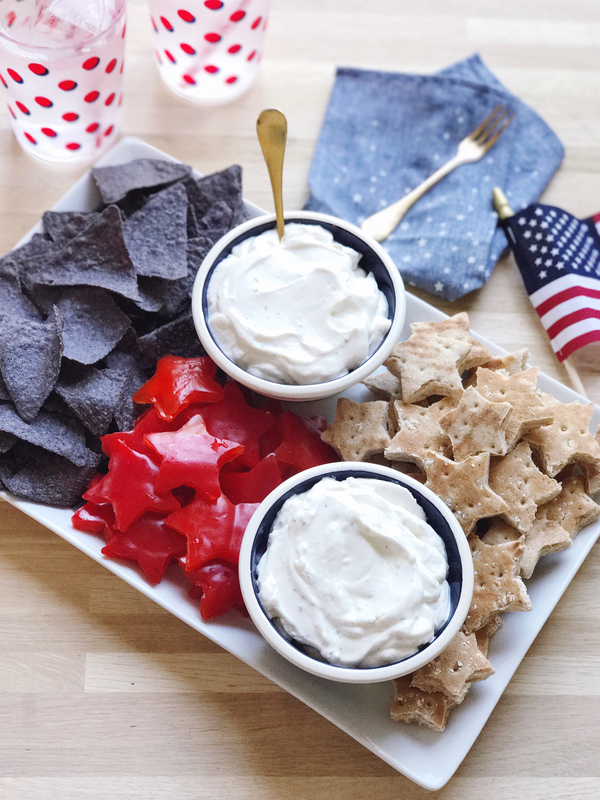 I like to keep the dips in classic flavors, because the Fourth of July is all about casual, simple entertaining – picking a few of these dips up in the dairy aisle makes the whole thing even easier to assemble. 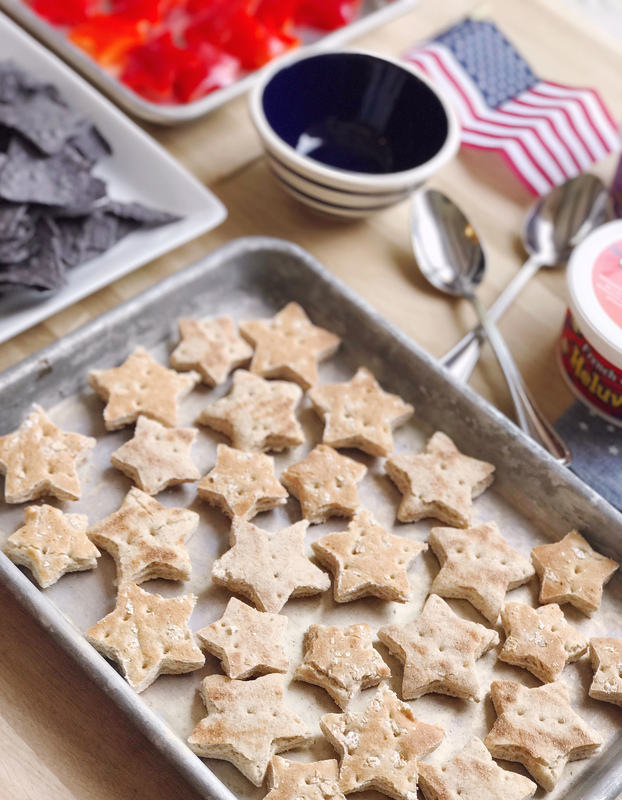 Next I layered in my red, white, and blue dipping snacks: red bell pepper stars, “white” pita bread stars, and some blue corn potato chips. 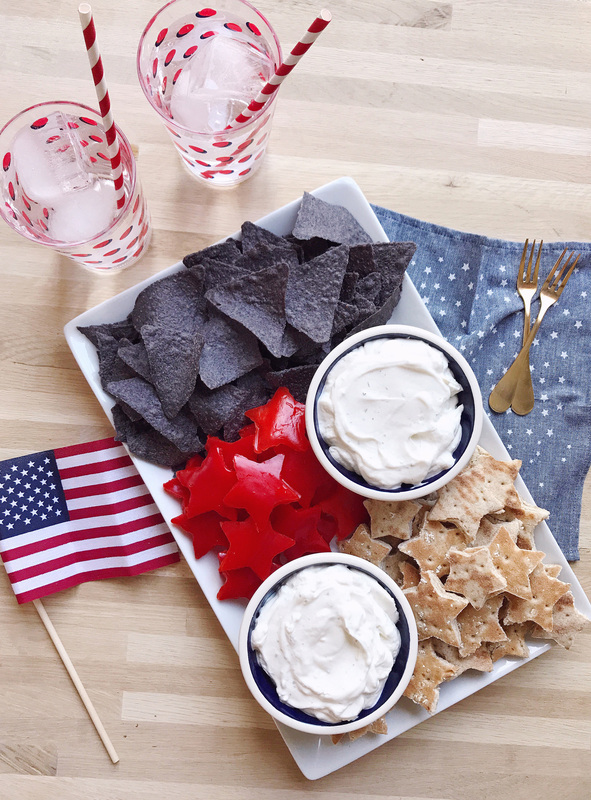 All that is left to do is to head outside and get snacking while you enjoy a cold lemonade, get the grill going, and enjoy your holiday weekend celebrations! And PS: don’t let your chips get caught naked this summer! Enter Heluva Good!s summer sweepstakes for your chance to win fun summer essentials for the ultimate Heluva Good! summer. This post was created in partnership with Heluva Good! – all opinions, images and content are my own. Thank you for supporting brands that support this site. Grilled Breakfast Pizza. Fourth of July Popsicles and Prosecco. 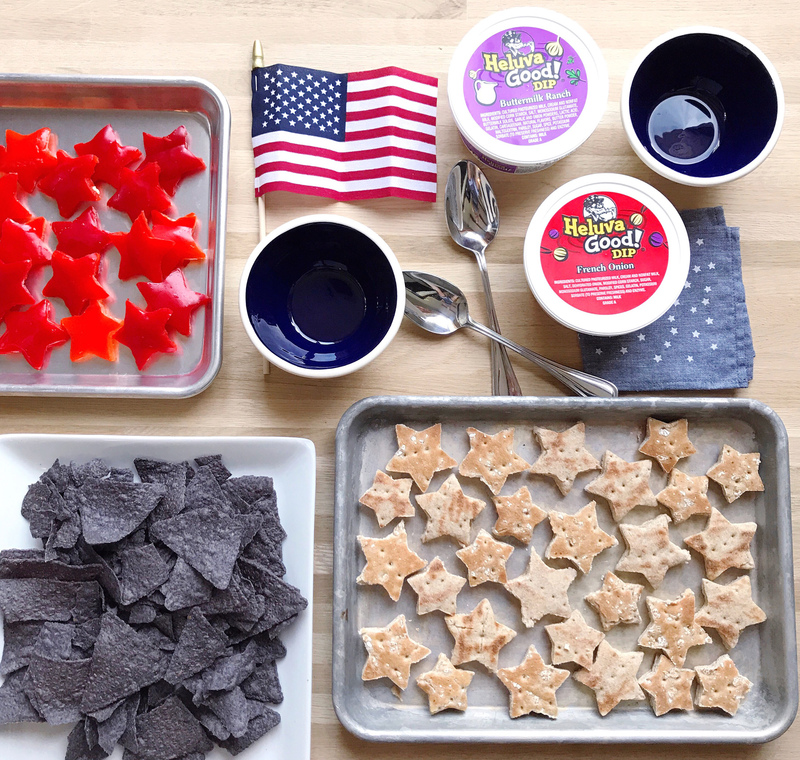 3 Responses to "Patriotic Chips and Dip." Those are peppers?!? My mind is blown. Must make all of this for our BBQ this weekend. We love Heluva Good dips!! Yup! Red peppers — easy peasy! Oh my gosh- the star cut outs are amazing! Peppers and pita bread! You are a genius, Kate!